I suffer from an affliction: Intermittent Immortality. From time to time, when I am feeling good, I know that I am immortal. This may happen after an extra cup of coffee, after lifting an especially heavy suitcase, or when a warm kiss with Kim makes us both 25 years old. Death is a remote possibility that mostly happens to other people. Yes, I made out my will and discussed funeral plans with Kim, but I didn’t really think death would happen. To me. I was going through the preparations because it was The Right Thing to Do. I’m not talking about immortality in the spiritual sense. Maybe my soul will live on somehow, but I’m not betting on it. And maybe all those Hindus are mistaken, and I won’t be reincarnated in some other life form, though it amuses me to think of the possibilities, especially if the Hindu gods have a sense of humor. Nor am I talking about immortality in the form of my genes living on through my children, though I do think a sense of humor is at work here. Similarly, I’m not all that interested in living on in the immortal words I post in this blog. I’d gladly settle for a moderate half-life through my words, which is far more than most writers achieve. But in the (immortal?) words of Woody Allen, “I don’t want to achieve immortality through my work. I want to achieve it through not dying. I don’t want to live on in the hearts of my countrymen; I want to live on in my apartment.” I’m not sure about our current apartment, but you get my point. That, however, is the Voice of Mortality. Writers, moralists, theologians, attorneys and funeral home directors have plenty to say on the subject of death, and for many people past the age of 50, mortality lurks like a dark humming shadow in the corner of the room, and the shadow gets larger and the hum louder as our infirmities pile up like the medicines that accumulate on our bathroom shelves. We can pretty much get used to this steady hum. It’s the crash when the Intermittent Immortality suddenly ends that creates my suffering. So the question is, what to do about it? My answer: denial and evasion. One evasive strategy is to choose to live in cyclical time rather than linear time. When I was teaching, I was firmly immersed in cyclical time as the patterns of starting and ending the school year repeated themselves for over 30 years. The same books I taught came to be associated with times of the year, so I celebrated the Christmas season with Hamlet’s eloquent madness and revenge, and springtime was always associated with ax murderers and Crime and Punishment. You can avoid the tug of linear time toward senility and death by connecting to the cycle of seasons, or as I did as a “snowbird,” with moving back and forth between Michigan and Florida. All that is required is some willful ignorance combined with selective appreciative attention. Another strategy? Keep kissing Kim. Denial and evasion? 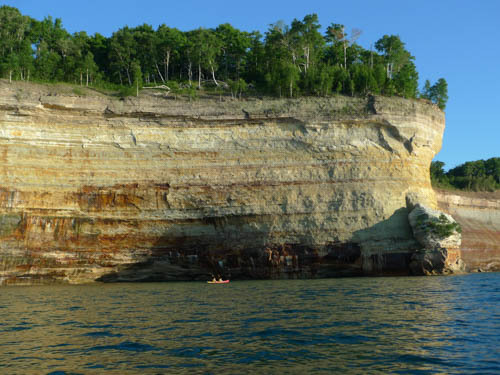 Three days ago Kim and I kayaked for six hours along the shoreline of Lake Superior. This is not what you do if you are gloomily accepting your mortality as you rest up from one course of radiation therapy while preparing for the next round. 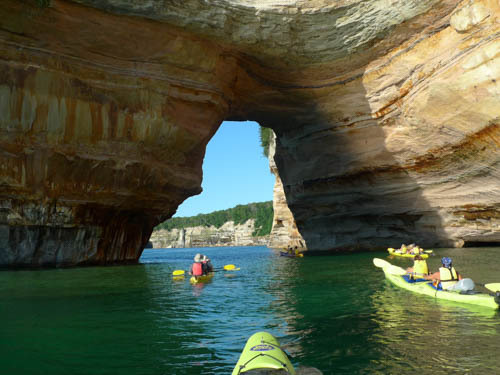 We heard the sound of the waves against the kayak, but no dark mortal hum. 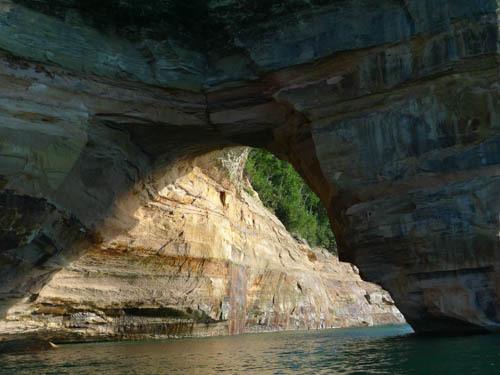 Michigan’s Pictured Rocks were just too beautiful for anything but their own beauty. And the paddling had a peaceful cyclical rhythm that took us out of time. We were thinking with our eyes—and our arms and backs. More photos will be coming in a future blog post. Just the other day Kim asked, “What are we doing building a house? We are in our 70s!” We are also thinking about buying a farm with horse stables that could be converted into God knows what—artist studios? Another possibility is an old cigar factory in downtown Traverse City, Michigan, that we could live in while remodeling the rest, renting out the space to help with taxes and insurance. But perhaps that is exactly why we should build a house. I think she is sensing the shadow of mortality, hovering darker and closer these days. What better time to make long-range plans? Denial and evasion. But of course, we will have to live within an hour’s drive to a good hospital. I have some of those thoughts about mortality, especially when many of our friends are dying. Life is a crap shoot. So, I live the life I love, and love the life I live!